In addition to being prey animals for several mid-sized predators, the two extant beaver species (American Beaver, Castor canadensis, and Eurasian Beaver, Castor fiber) are keystone species whose presence in an area improves wetland health and increases biodiversity. Beavers are most renowned for their construction activities, particularly in the felling of trees to be used in the building of dams. Their permanently sharp, chisel-shaped incisors are ideal for gnawing through wood. Trees 5cm (2in) in diameter are felled in minutes. When felling trees, beavers gnaw through the tree trunks just enough so that the tree remains standing. They then retreat and allow the wind to complete the task. This technique requires months to perfect and young beavers are occasionally injured or killed in the process. 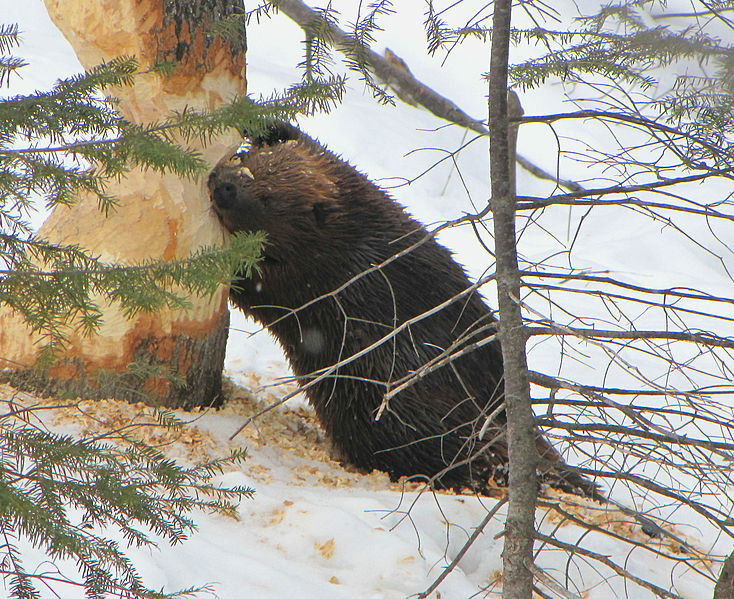 The visible damage to trees may seem detrimental, but the trees that beavers favor (aspens, poplars, cottonwoods, and willows) are characterized by rapid growth and beaver pruning of these trees stimulates reinvigorated growth the following spring. Dam building is most intense in the spring and fall, although lighter construction activities may go on at other times of the year. Beaver dams are preferably built across streams less than 6m (20ft) across and less than 1m (3.3ft) deep. However, the animals continually add new material to the structure resulting in dams that may be 100m (330ft) long and 3m (10ft) high over a period of years. Wood and stones are bound together by tightly compacted mud, which is applied by hand and not with their flattened tails contrary to popular belief. The mud, stones, sticks, and branches that beavers use to build their dams make for a very robust and solid structure, behind which a substantial pond is formed. By impounding a large body of water they effectively surround their home with a moat, increasing their security from predators. Moreover, a bigger lake means that the resident beavers have wider access by water to distant feeding areas. from the built up sediment within. In addition, the large areas of wetland that dams create reduce erosion damage and improve biodiversity. By slowing the flow of rivers and streams, beaver dams boost sediment deposition, a natural filtration system that removes potentially harmful impurities from the water. Increased sedimentation also brings more nutrients to the soil in and around the water resulting in abundant and healthy aquatic and riverside vegetation. Small aquatic animals such as larval fishes and frogs, in turn, use this vegetation as shelter, and of course herbivores use these plants as a food source. Beaver ponds provide refuge and habitat for waterfowl, wading birds, fish, amphibians, turtles, and aquatic mammals. Eventually, the buildup of sediment around the dam becomes too great overtime and the resident beaver colony is forced to move on. The abandoned, silted-up beaver dam creates the basis for a rich, new ecosystem, developing into a wetland meadow whose soil, enriched by decaying plant matter and beaver feces, support reeds, sedges, and eventually large trees. Also, trees that are drowned by rising water levels caused by beaver dams become ideal nesting sites for birds such as owls and woodpeckers. Of all the construction activities carried out by beavers, canal building is the least complex. They use their hands to loosen mud and sediment from the bottom of shallow streams and marshy trails, pushing it out of the way to the sides. The resulting channels enable the beavers to stay in the water while moving between ponds and feeding areas. This behavior occurs more often in summer when water levels are low. Other aquatic animals benefit from this activity as it can be a lifeline during drier periods. When one pond dries up, they can use the beaver channels to travel to another. 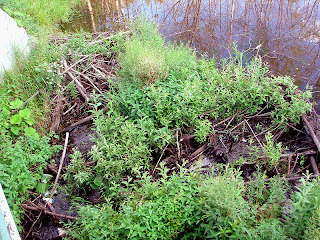 An example of a beaver lodge. Beavers are highly efficient diggers, usually excavating multiple burrows within the family territory. Hollowed into the bank of a stream or pond, a burrow may be a single tunnel or a whole maze ending in one or more chambers. In many beaver habitats, beaver families use burrows as the primary residence. Abandoned beaver burrows can in turn, be utilized by other animals such as otters or minks. Alternative riverside accommodation is provided by the lodge, a conical pile of logs and branches sited on the bank or isolated in the middle of a beaver pond. Lodges average 3-4m (10-13ft) in diameter, with rooms measuring 1-2m (3.3-6.6ft), and always incorporates a living chamber above water level. Sometimes there is also a dining area nearer the water. The entrance to the lodge is underwater out of sight of potential predators and usually includes a back exit. 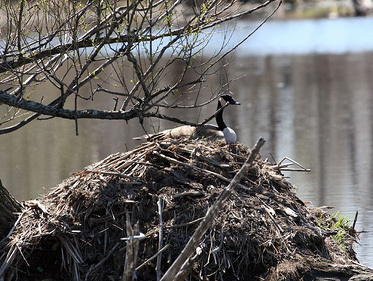 Occasionally, aquatic birds will set up their nests on top of beaver lodges, taking advantage of the structure's high vantage point and distance from the shore and any terrestrial predators. The beaver lodge is, in actuality, a highly specialized burrow composed mainly of organic materials rather than earth. Clearly, beavers are not far removed from their subterranean ancestors as environmental engineers. The extinct Miocene genus Palaeocastor, which were analogous to extant prairie dogs (Cynomys), were themselves keystone species whose digging activity helped to channel rainwater into the water table to prevent erosion. These animals would have also changed the local soil composition, and subsequently effected the flora and fauna of the area. True to their reputation, beavers are highly industrious animals whose construction work not only ensures their own survival, but the health of other organisms and the environment as a whole. When removed from an area, the aquatic habitat undergoes a noticeable loss of biodiversity. Unfortunately, intense hunting for their fur has lead to the extirpation of beavers on both sides of the Northern Hemisphere, with the Eurasian species in particular suffering a critical drop in numbers. Fortunately, hunting of these animals has largely ceased and populations are restoring themselves. The American species has regained much of its former range in the midwestern and eastern states, and its Eurasian cousin has grown from eight relic populations with an estimated 1,200 individuals in the early 1900s to over 600,000 today, revitalizing their ecosystems as their ranges expand. Sadly, this comeback ha not been without its backlashes. Beavers and humans come into conflict when beavers convert agricultural land into wetland. Beavers are a keystone species in wetland habitats and it remains for humans to acknowledge their environmental contributions and develop strategies that allow both humans and beavers to share the same landscape.